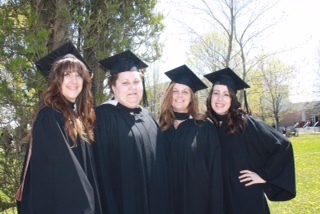 This past week 19 students from the first cohort of the UNB Saint John’s Licensed Practical Nursing (LPN) to Bachelor of Nursing (BN) Bridge pilot walked across the stage to receive their diplomas during spring convocation. The LPN-BN Bridge pilot is a cluster of six courses which, when completed successfully, allow Practical Nurse graduates from the New Brunswick Community College/Collège communautaire du Nouveau-Brunswick (CCNB) system to transition into year three of the BN program at UNB Saint John. This pilot is supported by Department of Post-Secondary Education, Training and Labour, and with funding received through the New Brunswick Council on Articulations and Transfers. Dr. Karen E. Furlong, Acting Chair of the Department of Nursing and Health Sciences acknowledges the work of faculty in the set-up and delivery of this pilot – in particular, Dana Manzer for her lead role in advising and supporting students during bridging coursework experiences and throughout the remainder of their BN program.